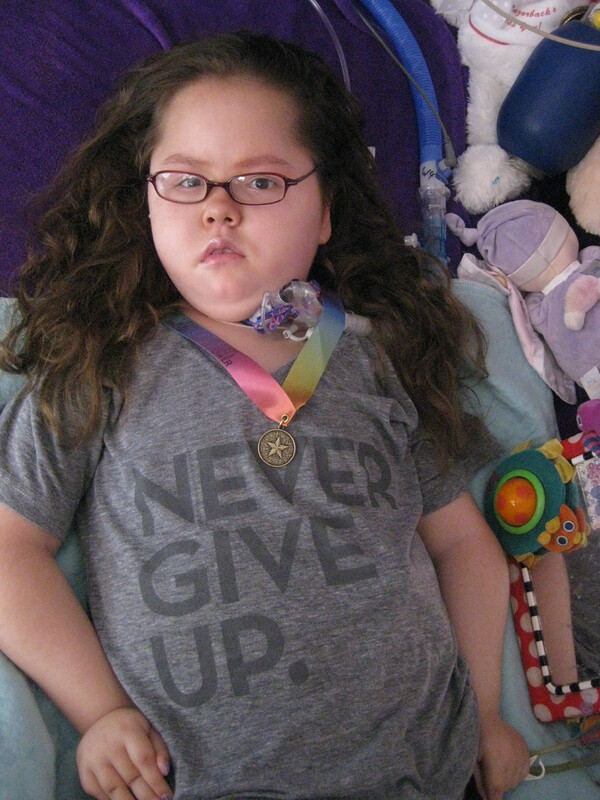 2013 IL Families of SMA Walk-N-Roll – Ally feeling better with her medal while recovering from an illness at HOME! Just wanted to send a quick update to let everyone know that the IL Families of SMA Walk-N-Roll was a HUGE success!!!! I believe the Ally’s Angels Team has raised $1320 and there might be a few more donations trickling in. It’s not too late to make a small donation in honor of Ally, all those affected by SMA and the angels too. With everyone’s support, one day there WILL be a CURE for SMA!!!! I am very, very, very grateful to all the family and friends who donated to this walk and/or past walks and fundraisers. I also brought around $1000 worth of donations for the raffle and food tables too!!! It really touches our hearts to see your names appear on our donation wall (and they don’t need to for every walk). Your prayers, emails and phone calls mean a ton too!!! We are so lucky that Ally is almost 7.5 years old, but times do get tough here and there, as we deal with SMA and complications (such as this current illness), but we also count EVERY blessing. In addition to monetary donations, I want to thank these businesses for raffle and/or food donations: Rosebud Restaurants, Aloft Hotel in Rosemont, Bakers Square at 3649 Harlem in Chicago, Caviar Salon on Belmont in Chicago, Joan Avey with Arbonne, Current Rehabilitation Speech Therapy, Dunkin Donuts on Irving near Harlem, Target at the HIP, Mama K (Kathy Kosla) for many creative donations, Le’s Nail Salon on Irving near Harlem, and I was able to donate some Pampered Chef and Tupperware. Ally is beginning to recover from her current illness, which was most likely just a typical stomach bug/flu/cold, but it hit her VERY HARD. I packed up all of her things and our bags for the hospital on ‘Thursday and even notified the docs we were coming, but with help of EXTRAORDINARY home nurses and Billy, she has been able to fight it at home, and my Ally is a fighter!!! She is finally off oxygen (most of the time but I just needed to restart 1/2 liter for sleeping with her ventilator). She is still needing motrin, tylenol, and some extra breathing treatments, but she is much better and heart rate has been close to her norm. I really thank everyone for their prayers, and of course God and the angels. The power of prayer is AMAZING!! Hope you enjoy the online album from the Walk-N-Roll. Ally stayed home with SUPERB, Nurse Anna, but we attended in her honor and brought all the donations. It was fun seeing and socializing some with soooo many SMA families. I didn’t get too close though to avoid possibly spreading any illness that could be traveling through our home. Hope to see many of these families again at another event this summer (in WI or OH), or camp at Center for Courageous Kids in Kentucky this September. Also looking forward to gatherings with friends and family this summer. PS — We LOVE healthy visitors and to plan outings with friends and family in summertime. Let us know if you are interested and a good date! ONE DAY till the IL Families of SMA Walk — PLEASE donate!!! 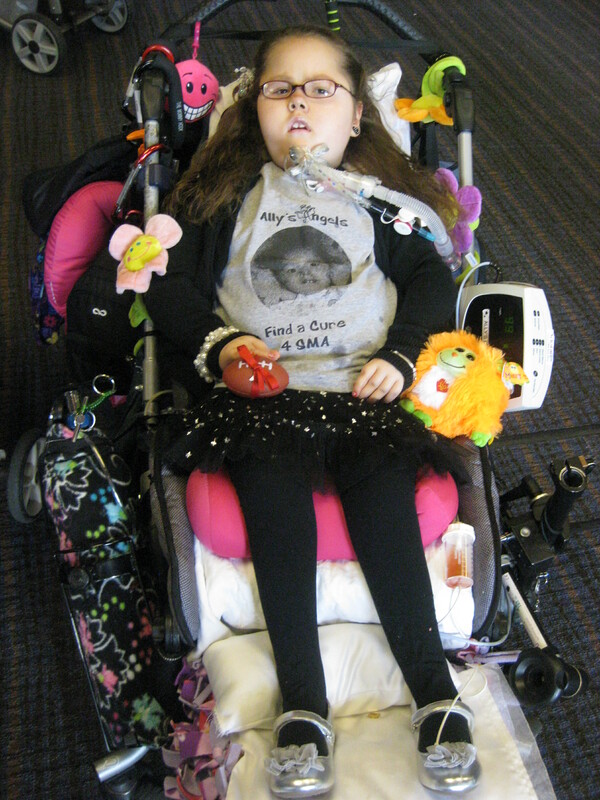 ONE DAY till the IL Walk-N-Roll for Families of SMA (Spinal Muscular Atrophy) and we are now at $970 with a minimum goal of $1000 in honor of my daughter, Ally. If you were thinking about making a donation, NOW is the time to help out, PLEASE and THANK YOU!!!! Ally has a bug/illness, but is starting to get better. Although all of her muscles are affected, she has a very strong will, warm heart and smart brain. She teaches me sooooo much as she overcomes so many obstacles. She will most likely be at home with a nurse, but I WILL be at the Walk in her honor since I am volunteering, bringing raffle/food donations, and walking in her honor and also in the memory of the angels. 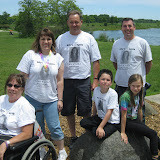 REMEMBER, every dollar$ brings us one step closer to a CURE for SMA and support for families. It’s also not too late to join the Ally’s Angels Team and walk with us on Saturday, June 8th at Independence Grove in Libertyville, IL. The walk and activities are REALLY a ton of FUN and very family orientated. It’s also not too late to make a donation to our raffle. I could pick it up today, or you could stop by for a “hello”. Thanks soooooo much to those who have donated to this walk and to others in the past.